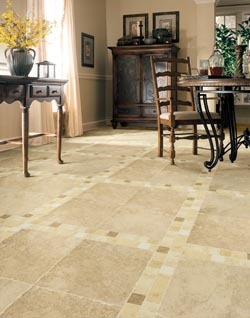 Create a sophisticated look in your place with classy and durable Ceramic Tile Flooring in Linton, IN. Ceramic dramatically transforms the look of your home or business. That’s because it comes in many styles, colors, and textures. Ceramic floor tile is an excellent flooring choice for budget-minded customers that want to give their floors a stylish makeover. More than a flooring store, our team also provides comprehensive ceramic tile installation. After you select your tile floor, allow our highly skilled installers to lay your tile. From delivering your product and measuring the area to removing old floors and installing your new ceramic tiles, we do it all. Our goal is to ensure a lasting floor, as well as make everything easier for you. Expect thorough and accurate work every time you use us. In fact, we are so sure you will be satisfied with our services that we provide an Ultimate Confidence Guarantee. If you're not happy with your new ceramic floor tile within 30 days of the install, our team replaces it with one of equal value. Also, if you ever have an installation-related problem in the future, we'll make it right at our expense. This is a lifetime guarantee on ceramic tile installation. It’s our commitment to you as our valued customer! Why Choose Ceramic Floor Tile? Add ambiance to your home by changing up your floors! A new ceramic floor updates the appeal and value of your home. From smooth and polished to textured and unglazed, our tile products come in many varieties. In addition, tile can look like natural stone, porcelain, or even wood. Whether you want a classy look or one that is more modern, you can rely on our experienced sales team to help you choose your tile. Tile doesn’t tear, scratch, or fade. It’s an excellent choice for busy households, or businesses, that need a durable yet attractive floor. It works perfectly in any room, such as kitchens, bathrooms, breakrooms, and even outdoor areas. Because it is resistant to moisture and stains, you can easily clean up spills without hassle. In addition, maintenance is simple. By sweeping and light mopping when needed, you ensure an attractive floor for many years. Some of the brands we carry include Daltile, Happy Floors, Design Distinctions, and Floorcraft. All of these products provide enduring quality and performance. For more information about floor care and maintenance, stop by our store for a free consultation. Contact us for more information about receiving $500 off your first purchase. We proudly serve customers from Linton, IN, and the surrounding areas.